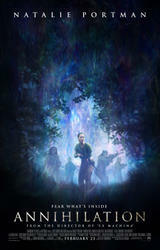 Fandango Correspondent Alicia Malone sits with 'Annihilation' writer/director Alex Garland and stars Natalie Portman, Oscar Isaac, Gina Rodriguez and Tessa Thompson to discuss the evolution of female roles. Looking for movie tickets? Enter your location to see which movie theaters are playing Annihilation near you.